The February Winter Storm has prompted O'ahu officials to open two shelters on the island. 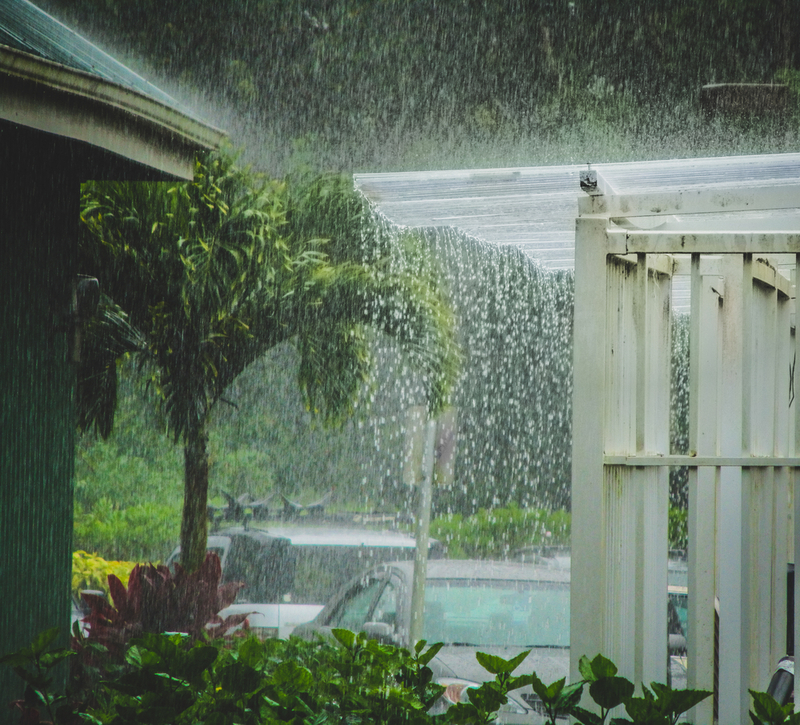 The Department of Emergency Management has advised all O'ahu residents that the shelters are open and available for anyone seeing refuge from high winds, rain or coastal inundation, as of 9 a.m. Sunday. The National Weather Service expects winds at least 40 mph, with gust over 60 mph. Swells on the north and west shores continue to build to dangerous levels, with anticipated surf heights in the 40' to 60' range. This means surges can bring ocean water over beaches, benches and roadways -- creating the potential for significant damage. Ocean Safety Lifeguards and other emergency officials continue to remind the public to stay away from affected shorelines or beaches. If you experience severe weather, coastal inundations or other emergencies call 911 immediately. Be the first to know about Haultail specials, events, and app updates. Haultail® provides a marketplace where persons or companies (“Customer” or “Customers”) who seek to dispose of certain materials, including construction/demolition debris (the “Demo Collection”) and/or desire pickup and delivery services (the “Delivery”) (Demo Collection and Delivery are sometimes collectively the “Services”) can be matched with persons who have made their vehicles available to provide such services to the Customers (“Drivers”) (Customers and Drivers are sometimes referred to herein as “Users”). Delivery. If a Customer chooses Delivery, Haultail® will request that the Customer identify the items to be picked up and delivered, as well as the address for pick-up and delivery. Drivers are prohibited from picking up or delivering items other than to/from the addresses submitted to Haultail® by the Customer. Delivery is “DoortoDoor.” This means that Drivers will pick up items for Delivery and thereafter deliver them as close as physically possible to the front door at the pick-up/delivery addressas possible(or such other entrance as may reasonably be requested by the Customer, such as a garage door)without compromising the Driver’s vehicle or the items to be delivered. In the event that the pick-up or delivery address is an apartment, condominium, cooperative or other building with a common entrance, “door” shall mean an exterior common entrance.Drivers are prohibited from picking up items for Delivery or making Delivery inside of a Customer’s home, office or other structure(s), including an apartment, condominium, cooperative or other building with a common entrance. This service also does not include set up or assembly of items or the removal of packaging materials.Drivers have the right to refuse Delivery if the items do not match those submitted by the Customer to Haultail®. Order ConfirmationA Customer may request Services by first selecting the type of service the Customer requires (i.e. Demo Collection or Delivery), the vehicle (i.e., truck, van) that the Customer requires and the address for pickup and/or delivery. Haultail® will calculate the Service Charges and the Customer will be prompted to confirm the order (the “Order”). Upon confirmation, PUT will match the Customer with an available Driver. Once matched, the Customer and Driver may only communicate regarding the Services through Haultail®. PUT uses a third-party provider to facilitate text, voice and other communications between Customer and Driver (to mask a party’s phone number and promote privacy). The third party’s terms of service will apply to the services the third party performs. For purposes of this Agreement, any decision by a Customer to accept Services from any Driver is made at the Customer’s sole and absolute discretion. Each Service provided by a Driver to a Customer shall constitute a separate agreement between such person(s) or entity(ies).No joint venture, partnership, employment, or agency relationship exists between you, PUT, any Driver or other third party as a result of this Agreement or use of the Service. Drivers have the right to refuse Services if the items do not match those submitted by the Customer to Haultail®. Driver Verification.Each Driver is required to drive only those vehicles which he or she has registered with Haultail®. Drivers are not permitted to have any passengers in their vehicles while performing the Services. All Drivers must also pass PUT’s vetting system, which includes a background check, driving record review, insurance, vehicle suitability, and other factors.Customers are responsible for ensuring that the Driver’s vehicle matches the vehicle on the Order confirmation and the Driver is as identified in the application. Drivers are responsible for insuring their vehicles to either PUT or the State of the vehicle’s registration requirements, whichever are greater. Haultail® is only available to person(s) over the age of eighteen (18). By becoming a Customer, you represent and warrant to PUT that you are at least 18 years old, and that you have the right, authority and legal capacity to enter into and abide by the terms and conditions in this Agreement.In certain instances,PUT may require you to provide proof of identity to access or use the Services, and you agree that you may be denied access or use of the Services if you refuse to provide proof of identity. PUT also expressly reserves the right to suspend or permanently deactivate any Customer account for any reason, including but not limited to a violation of this Agreement. Unless otherwise expressly permitted in writing, you are onlyeligible forone Customer account. As a Customer, you agree to pay the amount charged for your use of Haultail® (hereafter the “Service Charges”). Service Charges for an Order are all inclusive, meaning all fares and other applicable fees, such as disposal costs, taxes, surcharges and any other fees are calculated into the amount provided to you prior to your confirmation of the order. Pricing for Orders may vary depending on the type of Services you request. You are responsible for reviewing the ServiceCharges provided prior to confirming the Order. Your use of Haultail® constitutes your consent to those Service Charges, whether you actually reviewed them or not. Transaction Facilitation. All Service Charges are facilitated through a third-party payment processing service. PUT may replace its third-party payment processing service at any time without notice to you. Service Charges shall only be made through Haultail®, including voluntary gratuities. Cash payments are strictly prohibited. Refunds. All Service Charges are non-refundable unless otherwise noted during the ordering process. This no-refund policy shall apply at all times regardless of your decision to terminate usage of Haultail®, disruptions to Haultail®, or any other reason whatsoever, unless expressly noted otherwise herein. Credits and Discounts.PUT may provide you with credits or discounts to be applied to your future use of Haultail®. These credits or discounts are only valid on Haultail®, and are not transferable and have no cash value, unless otherwise required by law. Credits and discounts cannot be combined, and if the cost of your service exceeds any available credits or discounts, you agree to permit PUT to charge your credit card for the balance of the Service. Credits and discounts are also subject to any additional restrictions communicated to you in any relevant promotion. Credit Card Authorization. You have the right to submit your chosen payment method for the Services. Upon the addition of any new payment method, PUT reserves the right to require pre-authorization from your selected payment method to ensure Service Charges will be covered, and to protect against unauthorized conduct. While the authorization is not a “charge” it may reduce your available credit or balance for varying lengths of time depending on your institutions policies and procedures. PUT is not responsible for overdraft or NSF charges on your accounts and cannot provide assistance to you in attempting to recover any of those charges. By using Haultail® you expressly agree that PUT shall be entitled to recover from you any overdraft or NSF charges it incurs in processing payments for any Service Chargesaccepted by you. Delivery. Delivery times - including pre-scheduled times - are also non-binding estimates and may vary for the same or similar reasons. CUSTOMERS SHOULD REASONABLY EXPECT VARIANCES OF UP TO 90 MINUTES FROM ESTIMATED OR PRE-SCHEDULED DELIVERY TIMES. Customers will receive notice through Haultail’s messaging system of the arrival of the Driver. Customers are given a five (5) minute grace period from the time of the Driver’s arrival to the designated delivery address for the Customer to accept delivery. Wait times longer than five minutes will be subject to an additional fee. Inability to Complete Service. In the event that by no fault of the Driver or PUTthe Services cannot be completed, the Customer will be charged 100% of the estimated fee and all items scheduled for Delivery will be returned and/or the pickup of items scheduled for Delivery will be cancelled. Neither PUT nor the Driver shall be responsible for any damage to Customer’s property as a result of the inability to complete Services under this section. In the event of the inability to complete Services due to mechanical breakdown or other issues with a Driver’s vehicle, PUT will notify Customer of the issue and make every effort to find a replacement Driver to complete the Services at no additional cost to Customer. Technology. You agree and understand that you are responsible for providing your own mobile device to operate Haultail®, including the cost of any data charges. You also agree to maintain the minimum software required, which is Android 5.0 or iOS 9.0 (or newer). Haultail® insures each Delivery of newly purchased goods up to $250.00. Customers shall have the option to purchase additional insurance for newly purchased goods in their original packaging in amounts in excess of $250.00, up to $2,500, for an additional fee by selecting such option and amount of coverage prior to order confirmation.Items of extraordinary value (i.e. over $2,500) or items that are irreplaceable should not be moved via Haultail®. Items valued over $2,500 and shall require additional consents from the Customer and pre-approval by PUT. Customers are not required to purchase Insurance through Haultail® at full replacement value for newly purchased goods but agree that their failure to do so will limit PUT’s liability for damage to the amount of insurance actually purchased. Customer expressly waives any right to claim damages against Haultail® for failure to insure their goods up to full replacement value and under no circumstances may Customer seek to hold Haultail® liable for damage to their goods in excess of the chosen insurance amount. Damage that occurs during transportation (from the time the goods are placed on the truck to the time they are removed) will be repaired or replaced up to the insured amount chosen by Customer.Customers will receive a receipt from our third-party insurance provider at the time of Order confirmation which will contain instructions on how to submit a claim in the event of damage. Failure to submit a claim in accordance with the instructions provided may result in the denial of a claim. HAULTAIL® IS NOT A MOVING COMPANY, THEREFORE HAULTAIL® DOES NOT INSURE USED GOODS, AND CUSTOMER AGREES TO THAT THEIR USE OF HAULTAIL® FOR DELIVERY OF USED GOODS IS AT THEIR OWN RISK. By becoming a Customer, you agree to receive communications from PUT, including via e-mail, text message, calls or push notifications. You understand and consent to texts, calls or pre-recorded messages being generated by our automated system. Communications from PUT, its affiliated companies, or Drivers, may include but are not necessarily limited to: operational communications related to chosen Services and/or regarding the use of your Account, updates to Haultail’s features and the Services, promotions run by us or third-party partners and industry related news and updates. Your information (the “Information”) is any information you provide, post or publish to or through your use of Haultail® (including profile information) or send to other Users (including “feedback” submitted through Haultail® or information posted to social media). PUT does not own your Information. By using Haultail®, you grant PUT a non-exclusive, world-wide, perpetual, irremovable, royalty-free, transferable, sub-licensable right and license to exercise any and all rights to your Information (including but not limited to copyright, publicity, and database rights). You hereby consent to PUT using the Information, including PUT’s right to perform, display and distribute such Information for any purpose related to PUT’s business, either directly or indirectly. From time-to-time, PUT may offer you incentives for referrals of new Users (the “Referral System”). These incentives may come in the form of Haultail® credits or otherwise. Any such incentive or referral offered to you will be subject to the terms, restrictions and requirements stated therein. Your participation in the Referral System is subject to this Agreement and any additional Referral System rules published on Haultail® or included with the offer. Cause or encourage any third party to engage in any of the foregoing conduct. We cannot control the quality or safety of the transportation that occurs as a result of the Services and shall not have any liability to a Customer unless otherwise expressly provided for in these Terms. Use of Haultail® is provided on an as-is basis and without any warranty or condition, express, implied or statutory other than as expressly stated in these Terms. We do not guarantee or promise any specific result unless otherwise expressly stated, including the ability to provide or receive Services at any given time or in any given location. We do not warrant that use of Haultail® will meet your requirements or be error-free, uninterrupted or reliable. We disclaim liability for, and make no warranty respecting, connectivity or the availability of Haultail® or the Services. We also specifically disclaim, to the extent permitted by law, any and all implied warranties, such as title, merchantability and fitness for a purpose. If your local or state law prohibits such disclaimer, this shall not apply to you. We disclaim all liability arising out of your misuse of your Customer Account. To the extent that you believe that there has been unauthorized use of your account, you agree to notify us immediately, but in no event less than thirty (30) days after receiving a charge which you suspect is unauthorized. We disclaim any liability for the acts or omissions of other Customers, including unauthorized users. You may not rely on any statements not directly made by us relating to Haultail® or the Services and under no circumstances can you hold PUT liable for your reliance on such statements. We reserve the right, in our sole and absolute discretion, to monitor information shared by others through Haultail® and to remove any material that, in our opinion, violates the law, this Agreement or which is offensive, illegal or which constitute threats to others. PUT is not responsible for data charges you incur from your use of the Services, and you are solely responsible for any and all charges, including text message fees. To the extent you purchase Haultail® through a third-party provider, such as the Apple Store, Google Play Store, or android Market,you agree by entering into this Agreement that the third-party provider (e.g. Apple, Inc.), is not a party hereto and this Agreement creates no rights in you or any other person against that third-party. Be entering into this Agreement you permit such third-party provider, as a third-party beneficiary, to enforce these Terms. This Agreement incorporates by reference all the terms of any third-party “End User License Agreement” for purposes of which You are the end-user. In the event of a conflict between that agreement and this Agreement, the terms of this Agreement shall control. While PUT will seek to establish that its Drivers are vetted, qualified and drive pickup trucks that are owned and insured bythe named Driver, including driving and criminal background checks, we cannot be held responsible for any Driver’s conduct and/or misrepresentations or failures to disclose pertinent information or his/her failure to maintain insurance. We cannot guarantee that each Customer/Driver is who he or she claims to be. Please utilize Haultail®, including information provided to you, to ensure that each Customer/Driver is the proper person, including looking at photos of the Customer/Driver or confirm license plate information. We disclaim liability for dealing with underage persons or people acting under false pretense. We disclaim all responsibility or liability for any content, communication or other use or access of Haultail® by persons under the age of 18 in violation of this Agreement. You agree to indemnify and hold harmless PUT, its affiliates, subsidiaries, parents, successors and assigns, including each entity(ies) past and present officers, directors, employees and agents, harmless from any claims, actions, suits, losses, costs, liabilities and expenses (including reasonable attorney’s fees) relating to or arising out of your use of Haultail® or the Services including: (1) your breach of this Agreement; (2) your violation of any local, state or Federal law or regulation; (3) your violation of the rights of any third parties; (4) allegations that any submission or information provided by you infringes on any intellectual property rights of any third party; (5) any other activity connected with your use of the Services. This indemnity shall be limited only by the willful misconduct of an indemnified person, and shall not be limited by the negligence of any indemnified person. In no event will PUT, or any of its affiliates, subsidiaries, parents, successors or assigns, and each of our respective past and present officers, directors, employees, agents, or shareholders (collectively “PUT” for purposes of this section) be liable to you for any incidental, special, exemplary, punitive, consequential, or indirect damages arising out of or in connection with your use of Haultail®, the Services or this Agreement, however arising, whether through negligence or if such damages were reasonably foreseeableor otherwise known toPUT,or if PUT had been advised of the possibility of suchdamages. You may use Haultail® and the Services, including Delivery or Demo Collection, or other services developed in the future, but you agree that PUT has no responsibility or liability to you related to any transportation, good or other services unless expressly set forth in these Terms. In the event of any controversy or claim arising out of or relating to this Agreement, or a breach thereof, the parties hereto shall first attempt to settle the dispute by mediation, administered by the American Arbitration Association (“AAA”) under its Mediation Rules. If settlement is not reached within sixty days after service of a written demand for mediation, any unresolved controversy or claim shall be settled by arbitration administered by the American Arbitration Association under its Consumer Arbitration Rules. In the event of arbitration, the number of arbitrators shall be one. The place of arbitration shall be Boston, Massachusetts. Massachusetts law shall apply. Judgment on the award rendered by the arbitrator(s) may be entered in any court in Suffolk County,Massachusetts. Class action lawsuits, class-wide arbitrations, private attorney-general actions (including but not limited to the Private Attorneys General Act of 2004, California Labor Code §2698, etseq., and any other proceeding where someone acts in a representative capacity are not allowed (other than an action by an estate representative of an individual), nor is combining individual proceedings without the consent of all parties. Notwithstanding any other provision of this Agreement, disputes regarding the scope, applicability, enforceability revocability or validity of the restrictions in this paragraph may be resolved only by a civil court of competent jurisdiction and not an arbitrator. If any provision of this paragraph is found unenforceable or unlawful for any reason, the remainder of this provision shall survive and the unenforceability of the specific portion of this provision shall not affect the overall enforceability of the requirements to submit disputes to mediation/arbitration. You agree not to use any technical, financial, strategic, or other proprietary and confidential information relating to Pout’s business or operations, including User Information disclosed to you for any purpose other than as contemplated herein, nor disclose any such information to third parties without PUT’s express written permission. A party’s failure to act with regard to any breach of this Agreement shall not constitute a waiver of any subsequent breach, even if a breach of the same provision. PLEASE BE ADVISED THAT THIS AGREEMENT CONTAINS PROVISIONS THAT GOVERN HOW CLAIMS YOU AND PUT CAN BE BROUGHT (SEE SECTION 20 BELOW). THESE PROVISIONS, WITH LIMITED EXCEPTION, REQUIRE YOU TO SUBMIT CLAIMS AGAINST PUT TO BINDING AND FINAL ARBITRATION ON AN INDIVIDUAL BASIS AND NOT AS A MEMBER OF ANY CLASS, GROUP OR REPRESENTATIVE ACTION OR PROCEEDING. AS A DRIVER YOU MAY HAVE THE OPPORTUNITY TO OPT OUT OF ARBITRATION WITH RESPECT TO CERTAIN CLAIMS AS PROVIDED IN SECTION 20. By entering into this Agreement, you expressly acknowledge that you understand this Agreement (including the dispute resolution and arbitration provisions in Section 20) and accept all of the Driver Terms set forth hereinbelow. If You wish to become a Driver and make your driving services available through Haultail®, you must agree to the Terms of Service – Customer (“Customer Terms”), which can be found here. In the event of a conflict between these Driver Terms and the Customer Terms, these Driver Terms shall control the rights of a Driver. If you do not agree to be bound by the Driver Terms or the Customer Terms you may not use or access Haultail®. Haultail® is only available to person(s) over the age of eighteen (18). By applying to become a Driver, you represent and warrant to PUT that you are at least 18 years old, and that you have the right, authority and legal capacity to enter into and abide by the terms and conditions in this Agreement.You also represent and warrant that if you are accepted as a Driver, you will not allow other persons to use your Driver account, and you agree to be the sole authorized user of your account. Unless otherwise expressly permitted in writing, you are only eligible foroneDriver account.Each Driver must submit a complete and truthful Driver application. Each Driver applicant consents to provide PUT with a full and complete Motor Vehicle Report (“MVR”) for the prior seven (7) years for any state in which the Driver had a license at any time in that seven (7) year period, together with a criminal background check. Our policies related to MVR and criminal background checks can be found here. All such inquiries are processed through Checkr, Inc.You further agree that PUT may request that you obtain additional driving records or background checks during your service as a Driver on a periodic basis, which will occur not less than annually. PUT has the right to accept or deny any Driver application in its sole discretion and no rights are created in any person who submits an application simply because they have applied to become a Driver.PUT also expressly reserves the right to suspend or permanently deactivate any Driver account for any reason, including but not limited to a violation of this Agreement. Upon acceptance as a Driver, you must supply valid bank account information to establish automated payout for Services together with a completed W-9 Form containing the Driver’s SSN or Federal EIN. A Driver’s bank account information is not stored in any way, shape or form on the App.Failure to supply this information will result in the suspension or termination of your rights to be a Driver. For each vehicle you intend to use as a Driver, you must supply a vehicle license plate number, together with the year, make, model and VIN Number together with a certificate of vehicle registration and current (passing) vehicle inspection report complying with your state of registration inspection requirements (each a “Vehicle”).You must also supply photographs of the Vehicle and yourself. You further agree to have your Vehicle inspected not less than annually for certification with the Vehicle’s state of registration inspection requirements. You agree that PUT may provide vehicle information provided by you, including but not limited to the inspection report, to PUT’s liability insurers if requested to do so. While Drivers are logged into Haultail® and registered as “active”, PUTwill collect tracking information to connect a Driver with the nearest Customer. PUT provides Customers with a Driver’s name, locations, picture and Vehicle details (including your license plate number). You agree and understand that you are responsible for providing your own mobile device to operate Haultail®, including the cost of any data charges. You also agree to maintain the minimum software required, which is Android 5.0 or iOS 9.0 (or newer). Each Driver must maintain the minimum liability coverage for the state of registration of each Vehicle registered with Haultail®, or coverage of $100k/$300k, whichever is greater, for each Vehicle registered with Haultail®. You are required to get an endorsement on your insurance certificate provided to PUT showing coverage for use of the Vehicle for commercial purposes and provide a copy of said endorsement to PUT. You are responsible for all additional fees associated with these insurance requirements. You agree to update your insurance certificate to PUT at least annually or any time you switch insurers, whichever is earlier. You must immediately notify PUT of any lapse in insurance coverage for any Vehicle. Failure to notify PUT of any lapse in insurance coverage can result in the immediate termination or suspension of your Driver account. Damage to Vehicle; Maintenance; Repairs. You shall maintain each Vehicle in accordance with the minimum requirements in the state of registration for each Vehicle, or this Agreement, whichever are more stringent. Drivers shall also indemnify and hold PUT harmless from any and all damage to a Vehicle, or any other vehicle as a result of Driver providing the Services. Drivers shall not permit any passengers or other live animals of any kind whatsoever, including pets, excepting only registered Service Animals, in their vehicles while performing the Services. This includesCustomers as well as any and all third-parties who are not specifically authorized by PUT. YOU ARE SOLELY RESPONSIBLE FOR YOUR INTERACTIONS WITH OTHER USERS. YOU UNDERSTAND THAT WE MAYNOT CONDUCT CRIMINAL BACKGROUND CHECKS OR SCREENINGS ON HAULTAIL® CUSTOMERS. WE MAKE NO REPRESENTATIONS OR WARRANTIES AS TO THE CONDUCT OF CUSTOMERS. IN NO EVENT WILL PUT BE LIABLE FOR ANY DAMAGES WHATSOEVER, WHETHER DIRECT, INDIRECT, GENERAL, SPECIAL, COMPENSATORY, CONSEQUENTIAL, AND/OR INCIDENTAL, ARISING OUT OF OR RELATING TO THE CONDUCT OF YOU OR ANYONE ELSE IN CONNECTION WITH THE USE OF THE SERVICES, INCLUDING WITHOUT LIMITATION, BODILY INJURY, EMOTIONAL DISTRESS, PROPERTY DAMAGE, AND/OR ANY OTHER DAMAGES RESULTING FROM COMMUNICATIONS OR MEETINGS WITH OTHER USERS OR PERSONS YOU MEET THROUGH THE SERVICES. YOU AGREE TO TAKE REASONABLE PRECAUTIONS IN ALL INTERACTIONS WITH OTHER USERS OF THE SERVICES AND AGREE TO CONDUCT YOURSELF IN A PROFESSIONAL, COURTEOUS MANNER. YOU ARE SOLELY RESPONSIBLE FOR ENSURING THAT THE SERVICES A CUSTOMER REQUESTS ARE ACCURATE AND DO NOT CONSTITUTE A PROHIBITED USE, AS THAT TERM IS DEFINED AND DESCRIBED IN SECTION 7 OF THE CUSTOMER TERMS. YOU AGREE NOT TO UTILIZE ANY IMAGES, RENDERINGS OR PERSONAL INFORMATION OF ANY CUSTOMERS EXCEPT AS REQUIRED BY THE HAULTAIL® APP TO CONDUCT THE SERVICES. YOU AGREE NOT TO REPRODUCE ANY CONTENT CREATED BY AND THROUGH THE HAULTAIL® APP IN ANY OTHER MEDIUM, INCLUDING SOCIAL MEDIA, EITHER YOUR PERSONAL SOCIAL MEDIA OR THROUGH ANY BUSINESS ACCOUNT MAINTAINED BY YOU FOR PURPOSES OF UTILIZING OR ADVERTISING YOUR SERVICES FOR HAULTAIL®. YOU ASSUME ALL RISK WHEN ENGAGING THE SERVICES OF ANY OTHER USER AND IN CONNECTION WITH USING HAULTAIL®. Construction/Demolition Debris Collection (“Demo Collection”). If a Customer chooses Demo Collection, you must confirm the amount of material to be picked up matches the order and does not contain any Prohibited Items, including as necessary, taking and uploading photographs of the material as required by the App.Demo Collection is Curbside Only, meaning that all items to be picked up under Demo Collection must be brought by the Customer to the curb at the end of their driveway or walkway. You are prohibited from entering into a Customer’s home, or an active jobsite, for purposes of conducting Demo Collection. Once collected, you must cover and secure the area where the materials are located in your Vehicle with tarps or other materials sufficient to prevent spillage.You have the the right to refuse Services for any materials not expressly documented by Customer during the ordering process. You are expressly prohibited from providing Services for any items other than those identified. Delivery. You may only pick up items for Delivery from the address identified by the Customer and are prohibited from delivering to any address other than that identified by the Customer through Haultail®. You must confirm that the item(s) to be delivered match the Order and does not contain any Prohibited Items, including taking and uploading photographs of the items to be picked up. You have the right to refuse Services if the items do not match those submitted by the Customer to Haultail®. You are expressly prohibited from providing Services for any items other than those identified. You must securely tie down all items for Delivery prior to leaving the pickup address. Delivery is “DoortoDoor.” This means that you are to make delivery as close as physically possible to the front door at the delivery addressas possible(or such other entrance as may reasonably be requested by the Customer, such as a garage door)without compromising your vehicle or the items to be delivered. In the event that the delivery address is an apartment, condominium, cooperative or other building with a common entrance, “door” shall mean an exterior common entrance.You are prohibited from making Delivery inside of Customer’s home, office or other structure(s), including an apartment, condominium, cooperative or other building with a common entrance. This service also does not include set up or assembly of items or the removal of packaging materials. By becoming a Driver, you agree to receive communications from PUT, including via e-mail, text message, calls or push notifications. You understand and consent to texts, calls or pre-recorded messages being generated by our automated system. Communications from PUT, its affiliated companies, or Customers, may include but are not necessarily limited to: operational communications regarding the Services or your use of your Account, updates to Haultail’s features and the Services, promotions run by us or third-party partners and industry related news and updates. You will have the choice to opt out of receiving promotional related communications by following the link in any email, or instructions contained in any text message or changing your settings in your User account. PUT may, in its sole and absolute discretion, make available to certain Users or prospective Users, various promotions and referral programs. Unless made to you, these promotions create no rights, and have no bearing (of any kind) on your Agreement with PUT. PUT reserves the right to withhold or deduct credits or benefits if PUT determines that the conveying of such promotion or benefit on you was done in error, or in violations of the applicable promotion terms or this Agreement. As part of your Driver account, you may receive a unique code (compromised of some combination of letters, numbers and/or symbols) for you to distribute to anyone you deem fit, including other Users and prospective Customers or Drivers. You may only distribute these codes for promotional purposes and they must be given away for free. From time-to-time, PUT may offer you incentives for referrals of new Users (the “Referral System”). These incentives may come in the form of Haultail® credits or otherwise. Any such incentive or referral offered to you will be subject to the terms, restrictions and requirements stated therein. Your participation in the Referral System is subject to this Agreement and any additional Referral System rules published on Haultail® or in the offer. As a Driver, you acknowledge and agree that you and PUT are in a business relationship, and the relationship is solely that of independent contracting parties. You agree that no joint venture, franchisor-franchisee, partnership, employment, or agency relationship exists between you and PUT as a result of your use of the Services or status as a Driver or is otherwise created by this Driver Agreement. You have no authority to bind PUT, and you undertake not to hold yourself out as an employee, agent or authorized representative of PUT. PUT does not, and shall not be deemed to, direct or control you generally or in your performance under this Driver Agreement, specifically including in connection with your provision of Services, your acts or omissions, or your operation and maintenance of your vehicle. You retain the sole right to determine when, where, and for how long you will utilize Haultail®. You retain the option to accept or to decline or ignore a Customer’s request for Services through Haultail®, or to cancel an accepted request for Services subject to PUT’s then-current cancellation policies. With the exception of any signage required by law or permit/license rules or requirements, PUT has no right to require you to: (a) display PUT or Haultail’s names, logos or colors on your vehicle(s); or (b) wear a uniform or any other clothing displaying PUT or Haultail’s names, logos or colors. You acknowledge and agree that you have complete discretion to provide Services or otherwise engage in other business or employment activities. You will receive payment for any Services you provide in accordance with the terms with the Customer. All payments for Services are subject to PUT’s Commission, discussed below. You will also receive any gratuities provided by Customers to you, and tips will not be subject to any Commission. You acknowledge that gratuities are not required of Customers and you shall not make any representation to any Customer that a gratuity is expected or required for use of Haultail® or receipt of the Services. PUT will process all payments due to you through its third-party payments processor and deposit those funds into the bank account identified by you as set forth in Section 3. You acknowledge and agree that such amounts shall not include any interest and will be net of any amounts that we are required to withhold by law. You will receive, at the end of each tax year, a 1099 Form detailing the full amounts of any payments received by you for the Services you provide. You are solely responsible to pay all applicable federal, state and local taxes based on your provision of Services and any payments received by you and will indemnify and hold PUT harmless from any liability arising out of your failure to make any such payments. In exchange for permitting you to offer Services as a Driver through Haultail®, you agree to pay PUT (and permitPUTto retain) a fee based on each transaction in which you provide Services (the “Commission”). The Amount of the Commission will be provided to you prior to accepting an Order and agreeing to provide the Services. You expressly authorize PUT to set prices on your behalf for all charges that apply to your provision of Services. Pricing may vary depending on the economic conditions of your local market. PUT may change the charges at any time in its sole discretion based, including but not limited to changes based upon local market factors. PUT shall provide you with notice of any such changes, and your continued use of Haultail® as a Driver shall constitute your consent to such changes. PUTreserves the right to adjust or withhold all or a portion of any payments due you for Services if it believes that (i) you have attempted to defraud or abuse PUT or PUT’s payment system; (ii) unless and until PUT has resolved any outstanding Customer complaint about Services you have provided (for this clause PUT’s right to withhold payment shall be limited to payment due for the specific Customer for which the dispute arose); or, (iii) in the event that PUT reasonably believes that you have violated these Driver Terms, including without limitation those related to yourcompliance with laws related to your ability or right to drive your vehicle or your maintaining sufficient insurance. In the event of PUT withholding payments pursuant to this section, PUT will thereafter make payment to you in the event the matter is resolved, less any applicable costs reasonably incurred by PUT related thereto. Once accepted as a Driver, you will be granted, during the Term of this Driver Agreement (and subject to your continued compliance with the terms and conditions hereof), a limited, revocable, non-exclusive license(the “License”)to display and use any and all Haultail® trademarks or service marks (the “Haultail® Marks”). The License is non-transferable and non-assignable, and you shall not grant to any third party any right, permission, license or sublicense with respect to any of the rights granted hereunder without PUT’s prior written permission, which it may withhold in its sole discretion. You agree not to use the Haultail® Marksin any manner which is likely to cause confusion. You acknowledge that PUT is the owner of the Haultail® Marksand the licensor hereof, including all goodwill associated therewith, and that your grant of and subsequent use of the rights granted under the License will confer no additional interest in or ownership of the rights granted through the License and all such rights and, including goodwill, will continue to inure to the sole benefit of PUT. You agree to immediately cease any use that PUT determines does not confirm with the rights granted to you under this Section. You agree that you will not: (1) create any materials that incorporate the rights granted under this License or make or create any derivatives other than as expressly approved by PUT in writing; (2) use the Haultail® Marks in any way that tends to impair their validity as proprietary trademarks, service marks, trade names or trade dress, or use the Haultail® Marks other than in accordance with the terms, conditions and restrictions herein; (3) take any other action that would jeopardize or impair PUT’s rights as owner of the rights granted hereunder, including, without limitation, challenging or opposing PUT’s ownership thereof; (4) apply for trademark registration or renewal of trademark registration of any of the rights, any derivative or combination thereof, and any other name, or any trademark, service mark, trade name, symbol or word which is similar thereto; (5) use the rights granted under the License in connection with any product, service or activity that is in violation of any law, statute, government regulation or standard. Violation of any provision of this License may result in immediate termination of the License, in PUT’s sole discretion. If you create any materials bearing images or rights granted under the License (in violation of this Driver Agreement or otherwise), you agree that upon their creation PUT exclusively owns all right, title and interest in and to such materials, including without limitation any modifications or derivative works based on the Licensed rights. You further agree to assign any interest or right you may have in such materials to PUT, and to provide information and execute any documents as reasonably requested by PUT to enable PUT to formalize such assignment. Each Driver represents and warrants to PUT that they: (1) are at least 18 years of age and are able to lift 70 pounds; (2) possess a valid driver’s license for the appropriate class of vehicle you intend to use and are authorized and medically fit to operate a motor vehicle and have all appropriate licenses, approvals and authority in all jurisdictions in which you intend to provide Services; (3) own or have the legal right to operate the vehicle the Driver uses in performing the Services; (4) will ensure that each Vehicle meets the safety standards and motor vehicle requirements for a vehicle of its kind; (5)are named or scheduled on the insurance policy for the vehicle intended to carry out the Services; (6) have a valid policy of liability insurance meeting the minimum requirements of these Driver Terms or the minimum requirements in the jurisdiction in which the Services will be provided (whichever is greater); (7) are solely responsible for any and all liability which results from or is alleged as a result of the operation of the vehicle while participating in the Services (personal injuries, death and property damages); (8) are solely responsible for any violations of laws and any fines that may occur; (9) will not transport any prohibited items as detailed by on Haultail’s Prohibited Uses page; (10) will only use the vehicle for Haultail® as represented in the application; (11) will not discriminate or harass anyone on any basis including race, gender, sexual orientation or ethnicity; (12) will be solely responsible for compliance with any applicable statutory or department of motor vehicles requirements, and for all necessary contacts with such Driver’s insurance carrierin the event of a motor vehicle accident; (13) will not engage in reckless behavior, drive in an unsafe manner, operate a vehicle that is unsafe to drive,permit any unauthorized third party to accompany you in the Vehicle while providing Services, provide Services as a Driver while under the influence of alcohol or drugs, or take action that harms or threatens to harm the safety of the Haultail® community or any third parties; (14) agree to utilize a hands-free device or Bluetooth technology when using a mobile phone while providing Servicesor pull off the road to a safe area if you do not have a hands-free device or Bluetooth Technology; (15) shall not use headphones (other than legal hands-free Bluetooth technology) while driving; and, (16) to provide any further necessary authorizations to facilitate our access to your driving, criminal or other records during the term of the Driver Agreement. EACH DRIVER FURTHER REPRESENTS AND WARRANTS THAT HE OR SHE HAS READ THE TERMS OF SERVICE – CUSTOMERS, AND IS AWARE OF THE PROHIBITED USES AND AGREES TO NOT TO PROVIDE SERVICES FOR ANY CUSTOMER WHICH WOULD BE PROHIBITED PURSUANT TO THERETO. This Agreement is effective upon your creation of a Driver account and acceptance of these Terms. This Agreement may be terminated by either a Driver or PUT at any time for any reason. In no event will PUT, or any of its affiliates, subsidiaries, parents, successors or assigns, and each of our respective past and present officers, directors, employees, agents, or shareholders (collectively “PUT” for purposes of this section) be liable to you for any incidental, special, exemplary, punitive, consequential, or indirect damages arising out of or in connection with your use of Haultail®, the Services or this Agreement, however arising, whether through negligence or if such damages were reasonably foreseeable or otherwise known to PUT, or if PUT had been advised of the possibility of such damages. You agree that PUT has no responsibility or liability to you related to any Services you provide unless expressly set forth in these Terms. In addition to the severability provisions in Section 19 and 20, above, in the event that any portion of this Agreement is deemed illegal or unenforceable, such provision shall be severed and the remainder of this Agreement shall be given full force and effect. You agree not to use any technical, financial, strategic, or other proprietary and confidential information relating to PUT’s business or operations, including User Information disclosed to you for any purpose other than as contemplated herein, nor disclose any such information to third parties without PUT’s express written permission. This Agreement shall be governed byMassachusettslaw, without regard to choice of law principles.